Despite having some of the toughest laws in the country, reform advocates are looking to Indiana's GOP Congressional delegation to help tip the balance in this year’s immigration fight. After passing in the U.S. Senate in June, comprehensive immigration reform has come to a screeching halt in the House of Representatives. Now reform advocates are looking for votes from GOP lawmakers from states like Indiana to help push it through. “You come to Indiana, and it’s totally different (than in Illinois). Our political landscape is more Republican than it is Democrat and so we face a different sort of challenge,” said immigrant rights activist Jesusa Rivera of South Bend. Much of Indiana thinks of itself almost as a border state fighting a tide of immigrants who came here illegally. That notion was evident two years ago when Hoosier lawmakers passed Senate bill 590 which was modeled after the Arizona law cracking down on illegal immigrants. Portions of Indiana’s law has been struck down by the courts, and the debate over immigration has now moved from the states to the national level. The U.S. Senate passed a much ballyhooed bipartisan bill last month, but its fate is far from certain in the GOP-controlled House. And that’s where Indiana comes in. If even one of the state’s seven Republican representatives was open to reform, it could signal a gradual shift within the party and provide a crucial vote in the House. Calabro lives in Valparaiso, Ind., about an hour east of Chicago, and is a member of the Indiana Federation for Immigration Reform and Enforcement. She and other conservative activists are watching the immigration debate closely. But so is Rivera, who worked on farms as a migrant worker, even as a child. She says this issue is personal. 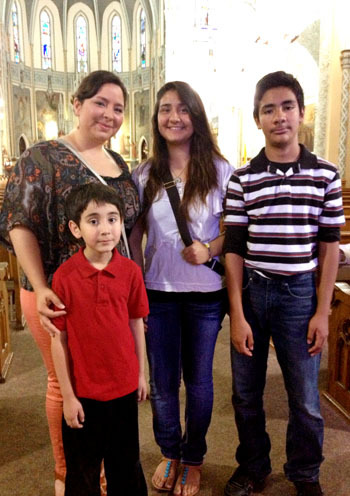 Many of those people who Rivera assists are immigrants who attend church at St. Adalbert Roman Catholic Church on South Bend’s predominately Latino West Side. 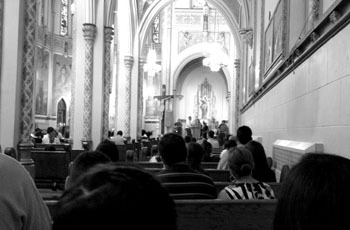 On a recent Sunday hundreds of undocumented immigrants worshiped with prayers and songs in their native Spanish, without worry of arrest. Teresa (who asked us not to use her last name) prays for a pathway to citizenship for her and her teenage son Jorge. They’ve lived in Indiana for years. “Reform is very important so that me and others like me can come out of the shadows,” Teresa said in Spanish. Also attending Mass was 18-year-old Crista and her three American born siblings — Crista says her parents are here illegally. “My dad has to be extra cautious when driving. My mom has to be extra cautious when looking for jobs and things like that. That’s a big deal. It’s a struggle for us,” said Crista, who also asked that her last name not be used. Crista worries that the bill in Congress may never get across the finish line. This year was supposed to be different. After President Obama won reelection with a majority of the Hispanic vote, Republican leaders like Marco Rubio said the party had to get behind immigration reform. So did traditional GOP backers like the U.S. Chamber of Commerce. Kevin Brinegar is executive director of the Indiana Chamber of Commerce. Brinegar points to a recent poll that showed 60 percent of Hoosiers support some type of reform. But the question remains: where will they get the votes? 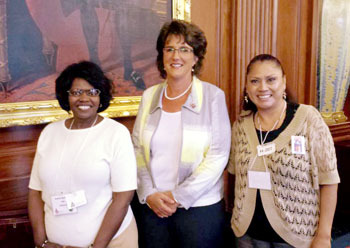 One might come from U.S. Rep. Jackie Walorski, a Republican from near Elkhart who represents Indiana’s 2nd Congressional District. In recent talks with Walorski, Rivera says the freshman congresswoman has been surprisingly open to talking about reform. According to Rivera, Walorski is sensitive to the plight of immigrants from her years as a Christian missionary overseas. Walorski declined to be interviewed, but in a statement to WBEZ, the Congresswoman said the nation’s immigration system is broken but needs a thoughtful approach to fixing it. The statement called for tighter security along the U.S.-Mexican border, along with an enhanced Visa program. Earlier this year on FOX News, Walorski spoke about the need for some kind of reform. That has conservative activists like Cheree Calabro worried. Calabro says she’ll keep close tabs on Walorski and other Hoosier lawmakers. One thing that’s changed is the voter demographics of Walorski’s 2nd District. In 2012 Walorski won her race by just a single percentage point. This, in a district that’s 8 percent Latino and growing. Follow WBEZ’s Northwest Indiana reporter Michael Puente on Twitter @MikePuenteNews.